The National Archives has an online database that contains World War II Enlistment Records. 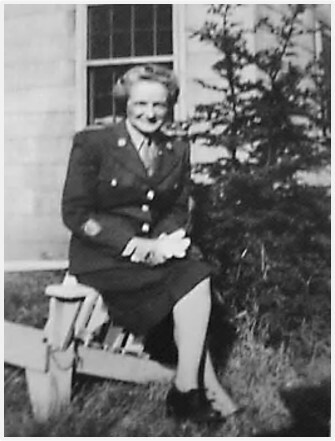 I found Aunt Marian’s records and discovered that she enlisted in the Women’s Army Corps (WACs) at Elmira, New York. Aunt Marian probably lived with several of her sisters after her father died. She was the executrix of the estate and the newspaper notice listed her address as Antes Fort (Lycoming County), Pennsylvania, which is where her sister Martha lived. She apparently later moved from Lycoming County to the home of her youngest sister Ruth in the northern Pennsylvania town of Lawrenceville (Tioga County). According to Wikipedia, about 450 people lived in Lawrenceville at that time. The nearest enlistment center to Lawrenceville probably was across the state border in Elmira, New York. A mystery has emerged. Did Aunt Marian attend high school? She attended the Mountain Grove Country School–an elementary School. She did not attend high school. Yet the enlistment record indicates that Aunt Marian attended high school for two years. Was her sister wrong? Did Aunt Marian actually attend high school?. . . .or did Aunt Marian lie on the enlistment form to increase the likelihood that she’d qualify to be a WAC? . . . or were the enlistment records of women who did well on the mental alertness test altered to indicate that they attended high school even if they hadn’t? Or did the enrollment personel slip that in? ..
That might be a possibility. Recruiters probably had to meet recruitment goals. . . and it would have been easier to meet them if the completed paperwork indicated that a potential enlistee met the requirements. Good questions, can’t wait to read the answers you will find Sheryl! I don’t currently have the answers, but maybe I’ll figure it out someday. . . hmm. . . I wonder if school records are available that far back. And so you are left with good questions to investigate! Maybe Aunt Martha said Aunt Marian didn’t go to high school because she didn’t graduate? That might be a possibility. The site is really easy to use. I entered a few names of people who I knew who’d served in WWII and their information quickly popped up. Which do you think it is? hmm. . if I had to guess, I’d guess that she lied about attending high school Since Aunt Marian was in her mid-forties when she enlisted (and went across the state line to enlist), I think that she might have figured that they’d never check to see if she’d actually attended high school . Those are good questions! I’m curious about the last listing on the page: film reels I wonder what that’s about? 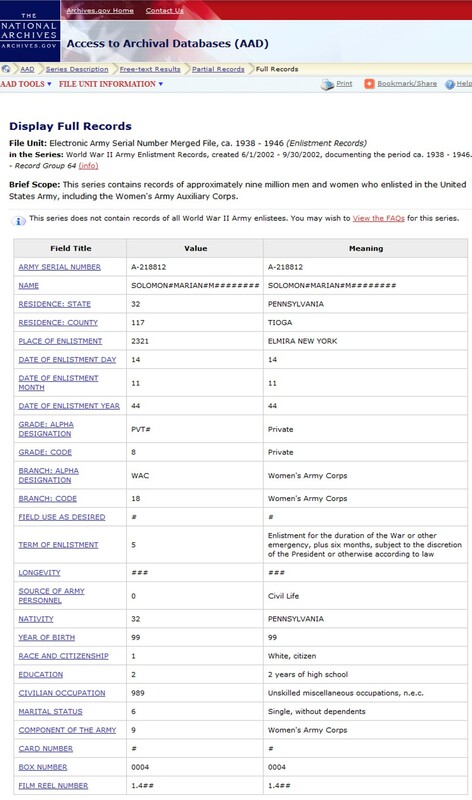 My guess is “film reels” refers to a roll of microfilm with the military records–but I really don’t know for sure. Some of the GenWeb sites do have school records, including names of students and teachers. And I’ve found that, by searching town histories, I sometimes bump into personal accounts which include that kind of information. One trick I’ve begun to use is searching with different search engines, too. I no longer use Google exclusively. Ixquick, for example, often turns up sites that Google either doesn’t index, or does so in a way that you have to go through pages and pages of results to find them. These are good suggestions. I need to research this some more. I learned something new. I had never even heard of lxquick until I read your comment. I am going to have to try it. I went to Ixquick because it’s a more private search engine than Google. It’s not that I’m searching for anything I wouldn’t want people to know about, but I just get irritated with Google. Ixquick doesn’t keep any history of your searches, and it certainly reduces the amount of advertising that pops up. That’s good to know. It is frustrating how advertising seems to dominate some sites these days. Your Aunt probably did not go to school past elementary school. My Aunt Alice and Mary didn’t go to high school in Pa. Alice was born 1895 and Mary 1899. My Aunt Helen who was born in 1905 started school at the age of 8 but unlike her older sisters went on to high school and normal school and became a teacher. Things changed for the better in education under Teddy Roosevelt and the Progressives. Another thing that is important about people who were born just before 1900 was WWI and the Spanish Flu epidemic. 40% of all the people died in the flu pandemic was between the age of 18 and 25. My Aunt Alice died from the flu but Mary never married because there was not many men for her to choose from left. So she stayed home and took care of her parents on their farm until they died then she was passed around from relative to relative until she found a job as a live in Nannie. Because of you aunt’s age she probably did really well on her entrance test. You learn a lot through life experiences. She might of taken advantage of finishing high school in the Army. Many did do that then. Aunt Marian’s oldest sister, Lillian, died of the Spanish flu. The first half of Aunt Marian’s life sound a lot like your Aunt Mary’s experiences.